First Mullet of the year. 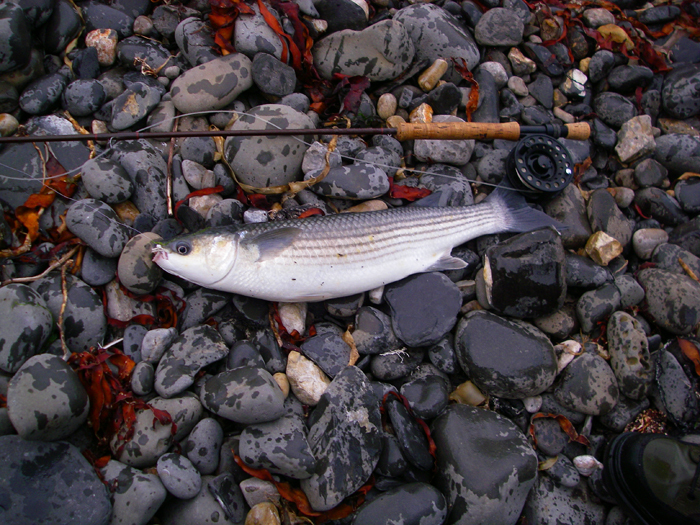 So far this year mullet have been notable for their absence along my patch. On the one occasion that there were a lot of fish surface feeding we'd left the fly rods behind so we didn't try to catch them. 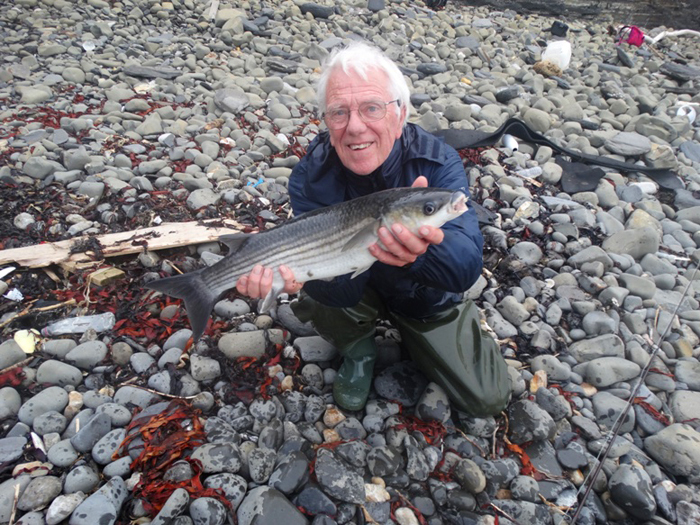 Anyway, The other day I'd invited my epal Austen Goldsmith, who lives and fishes down in Cornwall, to come and fish with me for a couple of sessions. We've been in touch for years but never managed to join up for a spot of fishing so I was hoping that there might be something worth catching (never certain!). Anyway, for a variety of reasons Austen couldn't get down to my place before about 6pm so when he arrived (despite his four hour drive) it was into his van and straight off to the coast - he's a hero. My pal Bill had rung earlier in the day to say that he'd seen some maggoty weed in a little bay so it seemed a good place to start. 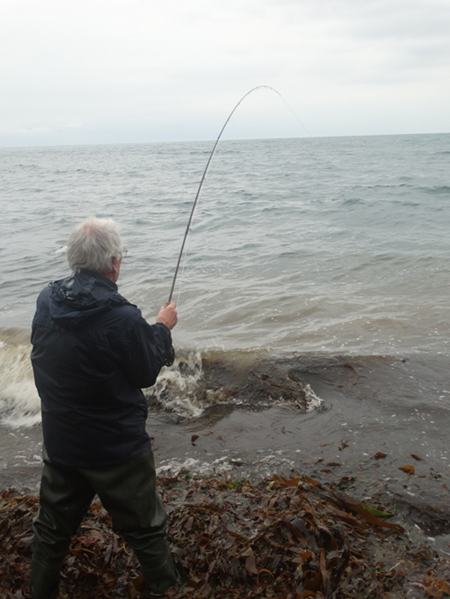 We tramped along the shore for a mile or more, wading through the deeper bits (it was nearly high tide) to find Bill and another pal Phil already in action with the spinning gear. They'd had a couple of knocks but nothing had been caught. However, there were already some decent mullet mopping up maggots twenty metres out. Encouraging! Austen had decided to spin for bass and had opted to leave his fly rod behind but mine was set up and when I saw a small group of mullet close in, by Phil's stance, I picked it up and crept down to the water's edge. Now I should say that I've decided to try and catch mullet on unbaited flies this year. My pal Alan Bulmer in New Zealand had just sent me his latest batch of maggot imitations to try so I tied one on and set to work. It was almost unbelievable. 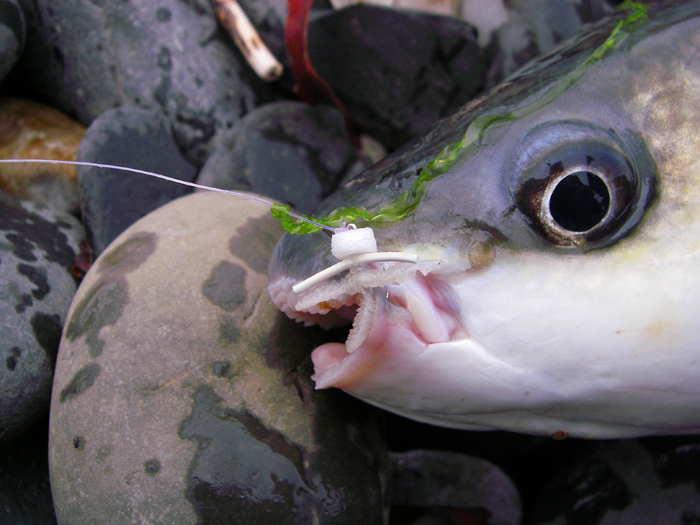 First cast, Alan's maggot creation settled on the water, the line tightened and I was into a good fish. For a minute or so the mullet seemed puzzled and simply wallowed about where it had been feeding then it set off for the horizon. Austen and Bill took pictures and all my pals made mocking remarks as the fish spent the next twenty minutes zipping out to sea with my fly rod arched over. Eventually I was able to slide it in close on a wave and lift it ashore. Wonderful! Of course by now the mullet had dispersed and the others had returned to spinning. Austen was using a Megabass DOT crawler which, to me, looks rather like a small chipolata sausage. He told me that they are very effective fished at snails pace with a few twitches of the rod tip to impart some movement. Anyway, everyone was finding things a bit slow. I sat waiting for the mullet to reappear (they didn't) while the others spun. Bill was using a SlugGill, Phil a plug and Austen his chipolata. It was some time before the next fish and it turned out to be a small ballan wrasse on Phil's plug. After the ritual mockery we set to again and by now it was past high water and getting pretty gloomy. Austen was twitching away, as he does and suddenly his rod bent. It was clear that the sausage lure had struck a rock and he said as much as he gave a tug to free it (it's weedlessly rigged). As it sprung free the lure was siezed by a decent bass and he was in. Amazing! The fish scrapped hard but it wasn't long before he was beaching a bass a bit bigger than my mullet. Fantastic! As it turned out that was it for the evening. A mullet a bass and a wrasse but we were all pretty satisfied. 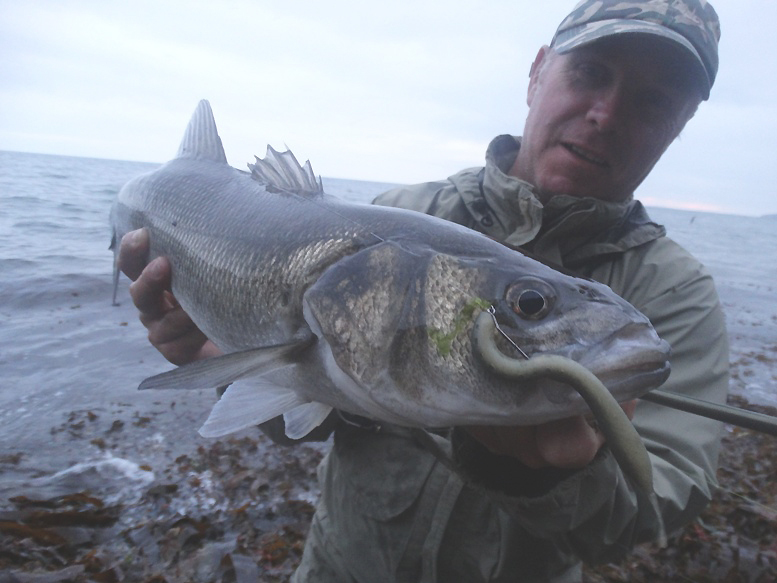 It was my first mullet of the year and my 'guest' had caught the decent bass he was after. All is well that ends well.